This cute Penthouse is a Walk-UP, no elevator available. 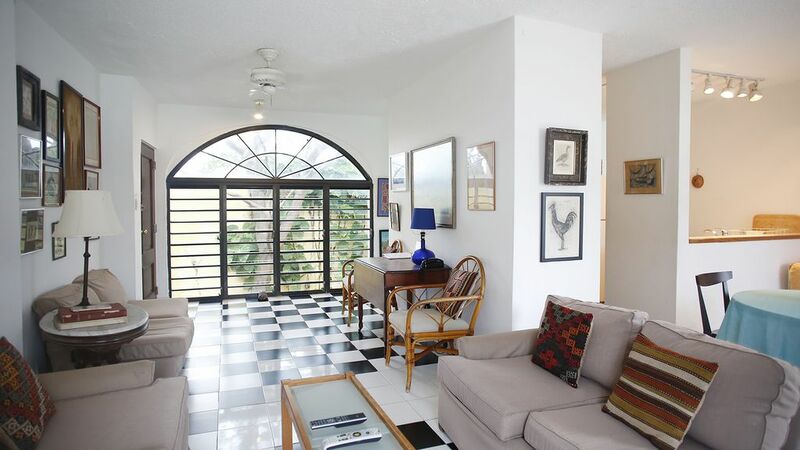 It opens to a beautiful patio and has a terrace with a view of Calle del Sol in Old San Juan. The entrance to the apartment is especially beautiful, getting up the stairway you will be welcomed by wonderful, tropical vegetation. The living room is openly designed and receives natural light from Patio and Terrace. The open kitchen is equipped and the dinning area opens to the terrace. The two bedrooms have A/C and can sleep up to 4 persons one queen and two twin beds. The bathroom has a shower only, and a washer/ dryer is available. Also included are cable television & wireless Internet. Please find more info about Old San Juan and what we provide below and contact our agents for any question you may have. With each confirmation we are sending a file with helpful tips on where to find our favorite local spots. VidaUrbanaPR is a result of our love to Old San Juan and our desire to share this beauty with you. Therefore we enjoy representing our neighbors (homeowners) who have decided to offer their homes to travelers. We are managing an incredible variety of properties, all very different from each other and yet in the same gorgeous old city, Some Truly Economic and as well Some of the Finest Locations in Old San Juan. We live in Old San Juan ourselves and like to welcome you to experience our Latin-, Tropical-, Spanish-colonial style neighborhood. Vida Urbana is committed to Serve Travelers at a Fair Rate and to help Finding The Rental That Meets Your Needs. We enjoy providing an Honest Service and being Available Before and During Your Stay. Our Message to all Tenants: Have Fun, Enjoy, Relax and don't hesitate to contact us for anything you need. We recently added as well apartments in the modern part of San Juan for you to visit and enjoy the "beach front" lifestyle of Puerto Rico and two "hidden get a ways" around the Island. Large apartment. Well-located. Bedrooms cool at night (AC), living room and kitchen comfortable in early morning, too warm at end of day. Lost water two full days due to a water main problem, so we were hot and sticky a good deal of the time. Really loved the location, so would definitely recommend! Very roomy. Comfortable beds. Delicious restaurants nearby. And Vida Urbana was a treat to work with-always quick to respond or offer help if needed. Only downside is that being a ‘penthouse’ it’s on the fourth floor and there is no longer a working elevator. Great experience. Prompt check in and check out. No issues while staying there. Close to shops and dining. Wonderful, comfortable, peaceful apartment in a great location of the old city. Easy access to shopping and restaurants. The only drawback was the inoperable elevator. We were told it would be fixed in the future. Would definitely stay there again! We had a wonderful time. The place was cozy and beautiful. Will stay again. Everyone (Wanda,Annett, and Lourdes) who took care of us was very nice. Really enjoyed our stay. Great location within walking distance to everything in old San Juan. 10% includes the 7% tourism tax and a 3% service fee. The rates do not apply for the annual San Sebastian Fest in January. Listed Deposit may be higher for stays longer than 1 week. Listed Cleaning Fee may be higher for stays longer than 1 week. Monthly Rates do not include the cost of electricity.